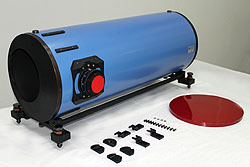 Collimators based on the parabolic off-axis mirrors ВК-800, ВК-1000, ВК-2000 intended for obtaining fine parallel rays in a wide spectral range. **Overall dimensions with installed dust caps. The possibility to install the equipment taken from the optical bench kit ОСК-2. NII OEP JSC provides additional services - primary certification of collimator.